Lynnette's mission is strictly about RESTORING our health and the health of the Planet. She strives to bring simplicity and harmony back to the minds of the consumers. She is on a mission to create a toxic-free world for the future of our children and grandchildren. As your Minister for the Environment, Lynnette is here to help shed some light on what is going on in our food supply. We are here to help you understand that food CAN be your friend if received from the proper clean farms. We also hope to enlighten you on the detriments that toxic poisons and GMOs (Genetically Modified Organisms) have on our food supply. If you follow our Fuel for the Body bike T.O.U.R.s, you will see how Organic Guru Lynnette Marie and her team pedals across the nation to educate the world about organic and sustainable living. We say YES! YES to clean food, YES to clean water and YES to clean air! We stand up for our food and health freedoms taking control of our food supply back from Monsanto. Although Lynnette is not a doctor, nurse or scientist, she has spent the past 11 years of her life studying and researching natural remedies and foods as well as researching the importance of natural and organic foods. What if we told you that you could have a life FREE of diseases? A life FREE of sickness? FREE of Rx drugs or OTC drugs? What if we told you that you could have the optimum weight you dream of? The energy you desire? The enhanced libido? What if we told you that you could have all this with OUT counting calories, fat grams or points? This can be YOURS if you take the Fuel for the Body Challenge! Food does NOT have to be rocket science. We need to understand that food can indeed be our medicine and help our bodies flourish and live with out breaking down. The infested world we live in today has wreaked havoc on our life as we know it. With all the pesticide, hormone, fertilizer and gmo infested crops it is inevitable that we cannot be completely free of all the toxins. With that being said, there is hope and there are solutions. We just need to clean up our pantries and re evaluate what comes into our homes. That is easier said than done for most of the world. Really, it is not that hard. 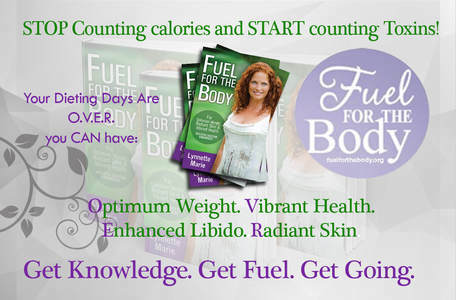 Keep following us on the tours and read, "Fuel for the Body" to help you understand better how to care for your body, so your body will care for you! You can catch Lynnette on various radio, web promos and media. Please visit our "Media Interviews" section for links to programs and call in numbers. These programs are sure to enlighten you of what is really going on with our food industry. If you are looking for a way to change the way you look, feel, and live contact us TODAY! Keep in mind, there are NO quick fixes to anything, there are NO magic pills or potion lotions or miracle shakes to take. This is a LIFE STYLE CHANGE. 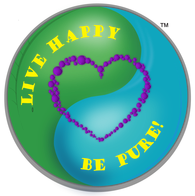 We help you transition your life style into a more organic and toxic-free way of living, therefore helping you to RESTORE the health you once had or were intended to have. You will never want to go back to the toxic infested world you once lived in. Please visit our "Healthful Web Links" under the 'What Other's are Saying' Tab for other sites with great inspirations.